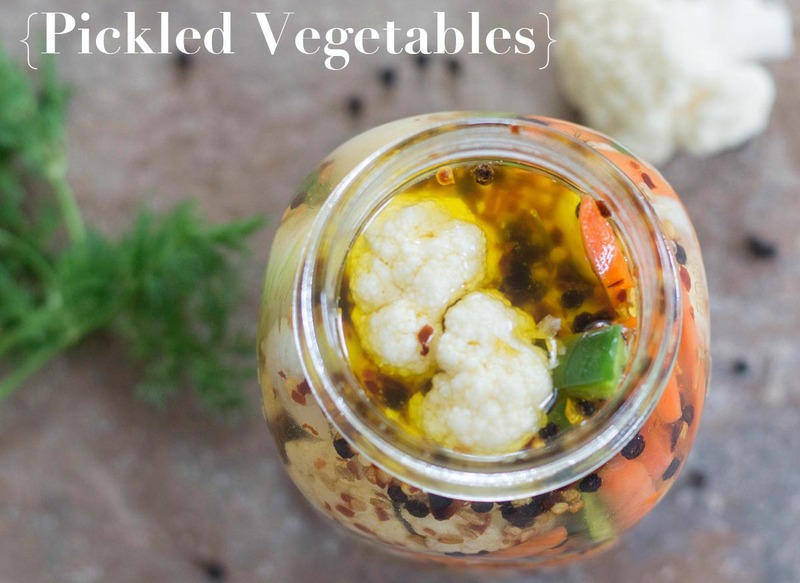 Pickled vegetables are easy to make using cauliflower, peppers, fennel, onions, garlic and carrots. Put any veggies in a simple vinegar and oil brine. This post contains affiliate links. How many times has this happened to you? You buy vegetables for a recipe and don’t end up using all of it? For me, there is always a couple cauliflower florets left over after making my Cauliflower soup or Red Lentil Soup. More often than not, my recipes call for using only half of a bell pepper like my vegan pot pie or my Bombay potatoes recipe. What to do with the other half? Last week for thanksgiving, I made glazed baby carrots and didn’t end up using all of the carrots. I find it incredibly funny that I had 4 baby carrots leftover. All of these veggies add up and I would just end up putting them into curry recipes or make side dishes out of them. This time, I wanted to do something different! This time, I decided to make quick pickles out of these leftover veggies. Boy, am I glad I did that! Not only was the pickling process so much fun, the veggies turned out to be sooooo delicious. 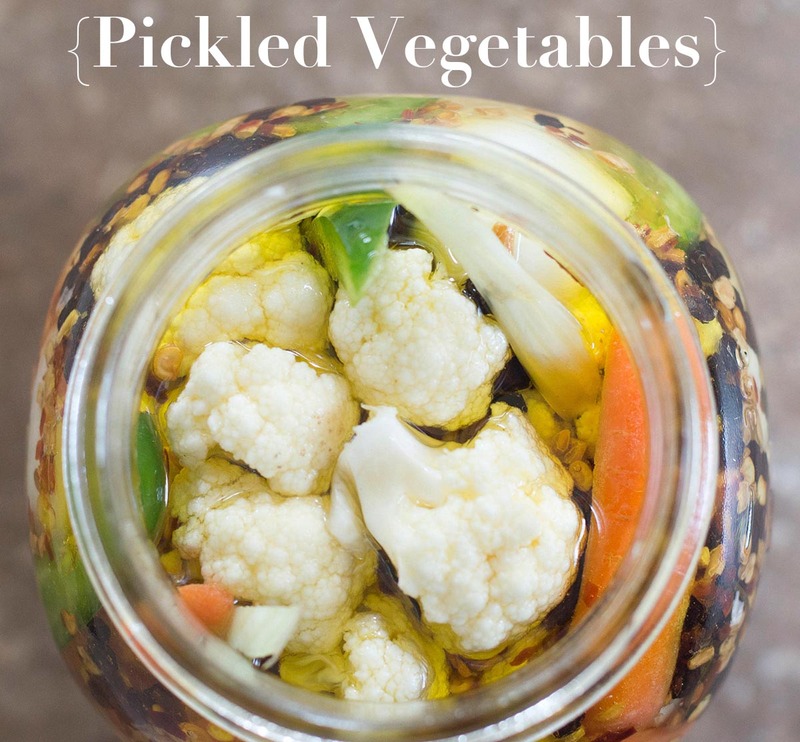 I figured that pickling the veggies would be a delicious way to use them and they would come in handy for other recipes. I see myself putting them on sandwiches, burgers, pasta and even as pizza toppings. The best part of this recipe is that you can add any kind of veggies using my liquid recipe as the base. Have artichokes lying around? Or green beans from a Barley Pilaf recipe recipe? Throw them into your version of pickled vegetables. And if you are a cauliflower lover like me, you are going to love this cauliflower rice biryani recipe that I just made. Its aromatic and delicious for any time of the year. The pickling process has proven to be a lot of fun. I want to try more home made pickling. I am definitely trying tomatoes next. This relish recipe by Debra Clark is also a great way to preserve tomatoes. I have a whole bunch of tomatoes that need to be preserved before the cold weather begins. Now that you know how to pickle any vegetable, you will never waste another veggie again! 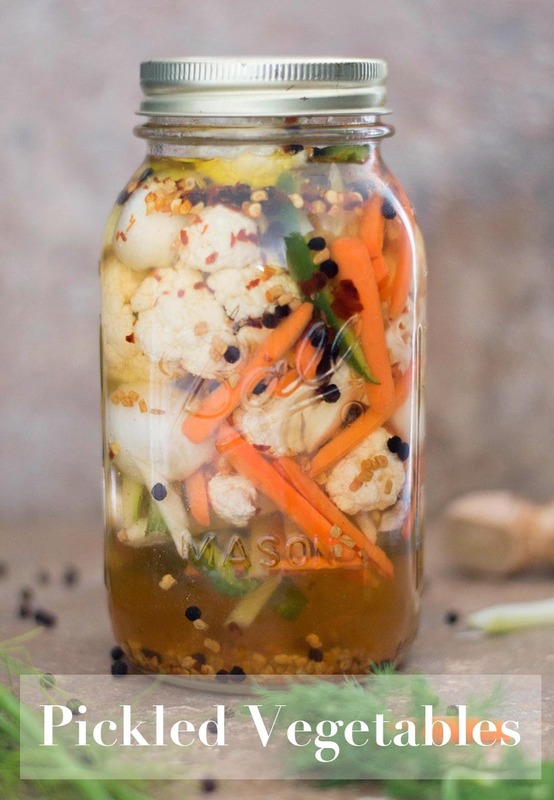 This pickling process will work for any veggie and its a great way to preserve your summer harvest for use in the fall or winter. If you have tomatoes leftover, do what my friend Debra does. She makes a mean tomato relish out of them and it is sooooo good! Tell me about your ideas. How do you preserve leftover veggies like tomatoes, cauliflower and carrots? Bring it to a boil on medium heat and then turn off the heat. When the liquid has cooled, slowly pour it over the veggies in the mason jar. Top the jar with about 1/2 cup of vegetable oil. Refrigerate it and it will last for about 6 months in the fridge. Is sugar necessary in pickle brine? Try using chayote squash (aka vegetable pear) spears or jicama spears as they are very noble soaking up the pickling spices and remaining super crunchy. We are wanting to learn and do pickling. My question is when we are done with everything do we have to keep it all in the refrigerator or can we keep what we are not immediately using on the shelf. Thank you. Thank you for your comment, Dawn. I let mine cool for a few hours while in the bottle and then refrigerate it. About 3 hours outside should be good, but, refrigerate after that. Can you make this recipe with raw veggies? I want to make stir fry, but always have leftover RAW veggies. Will it taste as well? Thank you…your recipe looks great! Thank you, Carolyn. Yes, Raw veggies work perfectly in this recipe. Like you, I always have veggies left over because recipes don’t use all of the veggies at once. So, feel free to add any raw veggies to this recipe. Can I add veggies at any time as I have them left over? The recipie looks great. Just what I need to keep from wasting veggies. Thank you????. Thank you, Dorothy. I wouldn’t recommend it. I like to add the veggies one time and let it ferment on its own. The reason is that the veggies are evenly flavored. If you add veggies later, they might not taste the same. I have been looking for a recipe like this! Definitely going to do it. Thank you.???? Just wondering why you add half cup of oil on top? Thank you, Wenda. The oil helps preserve the vegetables. When I put the veggies in sandwiches or any recipe after the pickling process, I make sure I dry of as much of the oil as possible. When all the veggies have been used up, I use the oil in recipes. Typically, that oil will be good for another 6 months after you use the veggies. I know that the half cup sounds like a lot of oil, but, I don’t use it all at once. The veggies don’t absorb most of that oil. I was lookimg for a recipe like this one, the only problem is that I can’t use sugar my husband and I are diaberics can I eliminate de sugar? Hello Esperanza. I am afraid I don’t know much about Diabetic diet to answer that question. Yes, you can eliminate the sugar, but, it might not taste well. It will be very tangy because the sugar helps even out the flavors. If you like, you can try a sugar substitute like Truvia? Not exactly sure how great it will taste, but, I will experiment on my end too. Let me know what you find. This is such a great way to make use of all the things you buy from the grocery store. I totally find myself making a dish with veggies and then the rest of the veggies that I don’t use end up sitting in the fridge until they go bad due to other plans for other meals. I think this would be a great way to get all of the bang for my buck for grocery spending. I can’t wait to try this recipe! Thank you for sharing! Thank you, Billy. I am so happy to hear that. I just tried with pickling broccoli and it turned out delicious! Do you have to use oil and all the sugar in the pickles? Thank you, Evelyn. You can adjust the amount for both the sugar and oil to your liking. It is useful in the pickling process because it adds flavor and also helps soften the cauliflower. Such a great idea! I’ll bet it tastes amazing! Thank you, Megan. It was delicious! Pickled vegetables are a huge thing over here in Hungary and are served at pretty much every meal, love the look of these, they sound delicious! OMG this is such an amazing idea. 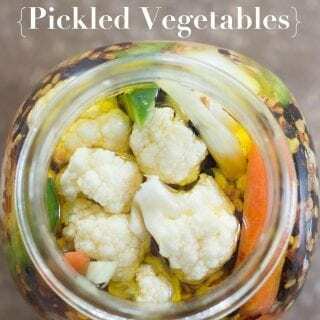 I usually bake my veggie leftovers and have them for dinner or I make veggie pizza – I call this “recycling the fridge” 😀 BUT to make pickled veggies out of leftovers… this is just great! Pickled veggies are very healthy for gut and good bacteria. Thanks a lot for this tip. Sharing this!